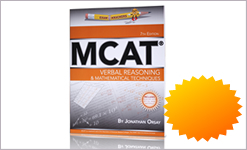 MCAT Verbal Reasoning tests comprehension of the texts given and consists of material from the social sciences, humanities and natural sciences. It is in a multiple choice format where answers are deduced from the passages given. The length of this sub-test is 60 minutes. You will have 40 multiple choice questions with 4 possible answer choices per question. 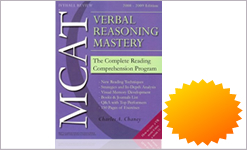 To be prepared for the Verbal Reasoning section requires the right study material. Below you will find different types of study aids that we recommend that will help you ace the Verbal Reasoning section. For a limited time only: $5 for shipping by courier to anywhere in the US or Canada (no extra shipping fee for additional items). 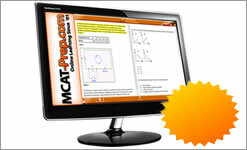 This Verbal Reasoning website, prep courses and review described herein and the trademark The Only Prep You Need are owned and operated by MCAT-prep.com and RuveneCo Inc. Information regarding changes to the new test can be found here. 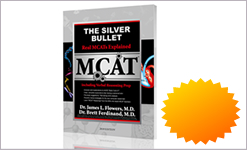 To purchase online courses or books, videos or MP3's, we recommend The MCAT Books Store. This website recommends Futuredoctor.net for premed information. The website www.aamc.org is the official website of the Medical College Admission Test which is not affiliated with nor endorses our products.